It is a product of high quality both in terms of content of natural oils and appearance. Redken is class and quality oriented. Diamond Oil Shatterproof Shine Intense is a product that comes in a glass bottle of irregular shape. The glass of the bottle is dark, thanks to which we can be certain as to the proper storage. Consequently, we can be sure that the product it will not go rancid and retain its most valuable properties for longer. The whole package looks like a polished jewel. It is one of the most imaginative and exclusive releases of hair oils. The bottle is unfortunately not equipped with an atomizer or even a pump for easier application, only a glass pipette to apply the product on our hair. Although it looks impressive – unfortunately, it is not very comfortable to use. The glass pipette can easily slip out of your hand and break by falling on the floor. Redken oil stands out among other products primarily due to the high concentration of natural oils and only a content of silicones and comedogenic substances. 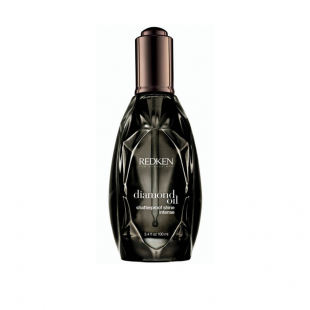 Redken Shatterproof Shine Intense comprise as many as six high-quality oils. Their effects on hair are really worth describing. Sunflower oil – the richness of linoleic acid (about 63%), waxes, phospholipids (lecithin), carotene and vitamin E. Significantly strengthens and regenerates strands, provides resilience. Additionally, it makes your hair shiny and soft. What is more, it perfectly moisturises and protects against the damaging effects of sun radiation and harmful, adverse weather conditions. Olive oil – is beneficial especially for very dry, lacking vitality and resilience, hair. The product perfectly conditions and adds gloss, which affects hair’s beautiful appearance. Consequently, making it silky and significantly increasing its resistance to damage. Jojoba oil – moisturises your hair and deeply nourishes. It stimulates cell renewal, contributes to the regeneration of damaged wisps. Effectively protects against solar radiation, frost or strong wind. Moreover, it makes strands resistant to breakage, they become more flexible and stronger. Coconut oil – a very popular product and willingly used in hair care. It provides essential minerals (such as: potassium, zinc, and magnesium). It closes hair cuticles and forms a reinforcing coating on the surface. Moreover, it leaves our wisps shiny and smooth, helps to rebuild the protein structure and perfectly strengthens hair. Camelina seed oil – comprises high content of unsaturated fatty acids (approximately 90%) and the richness of natural antioxidants from the group of tocopherols (especially vitamin E). Thanks to the high content of EFA from the seeds of camelina, oil has strong nourishing, regenerating properties, improving processes of hair renewal. What is more, it regenerates mature hair and slows the effects of ageing. Camelina oil helps fight atopic dermatitis, dandruff and psoriasis. It creates a barrier on the hair surface which prevents contamination and toxins from penetrating into the interior of wisps. Leaving hair nourished, soft and smooth. Apricot oil – is very well absorbed, it does not weigh hair down and leaves no greasy film on the surface. Furthermore, it nourishes and strengthens both hair and scalp. Impresses with its subtle scent, adds shine. Facilitates hair styling and conditions it, adjusting the moisture level. Thanks to apricot oil, your hair can be easily brushed and does not tangle. Diamond Oil Shatterproof Shine can be applied on dry or damp hair. The product is efficient, 2-3 drops are enough to apply from the mid-length hair. What is more, oil can also be applied only on hair ends. However, applied on damp wisps, absorbs quickly and works as in intensive treatment. Applied on dry hair will add shine and provide a nice look. Additionally, the cosmetic protects hair from damage. The bottle has a capacity of 100 ml.